Riverside Lodge Berlin i Berlin, Tyskland: Bestill nå! You can cancel your booking free of charge up to 5 days prior arrival date. In case of a late cancellation or no show we will charge the first two nights of your booked stay. The Riverside Lodge, the most tiny hostel in town - is not a mainstream hostel rather as unique as our guests. Choose something different! We offer a personal, cozy atmosphere in an exciting city. We offer two spacious double rooms with a private kitchen and full bathroom in an apartment next door to the Lodge (34,- Euro per person). Small groups are also welcome. Make yourself at home while on the road. Youve seen many places ......, this one youll remember ! 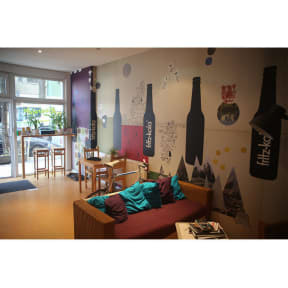 We are looking forward, to welcome you in our little, privately run hostel, the Riverside Lodge Berlin! You can cancel your booking free of charge up to 48 hours prior arrival date. In case of a late cancellation or no show we will charge the first two nights of your booked stay. Once you made a booking, you need to CONFIRM YOUR ARRIVAL TIME by email! If you do not send us an email, we will cancel your booking at the very latest 24 hours before the arrival date.